oomph. : mad skills with a spray can. love graffiti. not the kind you find on freeway signs, under bridges, or on highway overpasses. good graffiti. like this. done with permission. it's hard to find so when i saw this wall, i had to pull over. unfortunately, it was on the corner of the busiest intersection. in an industrial area. during the busiest morning hour. add to that morning shadows, gusty winds, and less than a minute to get this done by myself (before the big rigs started honking at me to move)...the shots are what they are. this top is another black friday, two-sizes-too-big shirt, but i liked the details...pinched sides, buttons on the derriere, and a huge collar. 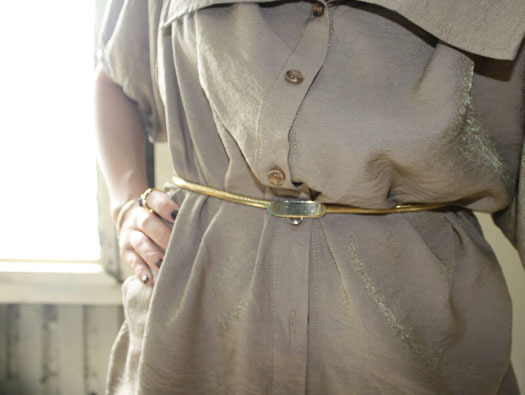 THAT BELT MAKES THE OUTFIT TRULLY PERFECT! I like these shots great background! awesome photos, great story too :) lllooovveeee this outfit! pretty outfit! I really love it! I love your outfit, very stylish. I love readin your blog, maybe we can follow each other? Love the top. It is silky and that shimmering gold is so lux. You always look so pretty!! I love the outfit! The belt is gorgeous!! Amazing outfit! Very urban and chic. @ jackie - love the ones at palama settlement too! The first picture is all kinds of gorgeous! A definite WIND-IN-HAIR moment. I'm loving all the gold accessories together. Details details details <3 You rock SOLID. Great outfit. So chic, simple and with the perfects details. You wouldn't notice that belt at first and then there it is. It's gorgeous, an understatement but definitely works to pull your outfit together. Love it! I like your style! and your belt!